This week I am working on a custom quilt; a baby quilt very much in the spirit of the Little Folks Quilt made earlier this year (see here), albeit a miniature version. The quilt top is pieced with all fabrics from the Little Folks collection by Anna Maria Horner and Dobby Dots from the Pastry line. The baby quilt top is finished, the backing prepared, the quilt sandwich basted and I have started quilting - a familiar process. Again, I wish I could convey in a picture how deliciously soft this quilt top is, and how similarly beautiful the voile fabrics are to work with. There could not possibly be a more perfect fabric for babies. Today I am going to spend some time adding machine and hand quilting detail to this baby quilt, the combination of these two together with the use of brightly colored threads will add much detail to the quilt. This is going to be another beauty! Voile is perfect! Oh my, it's going to be stunning! I agree - that fabric is heavenly. I've used some in my Fairytale Patchwork quilt in progress (combined with the Far Far Away line) and it's just amazing. I do find it a tad more difficult to work with, but SO worth it! As usually, your color combination just glows. How nice to do this simpler piecing work after you last project, I'm sure! Such a pretty quilt! What kind of thread are you using? Looks like crochet cotton or perle cotton. Ooh Lovely! I bet it is super snuggly! I love that you're adding some hand quilted details. 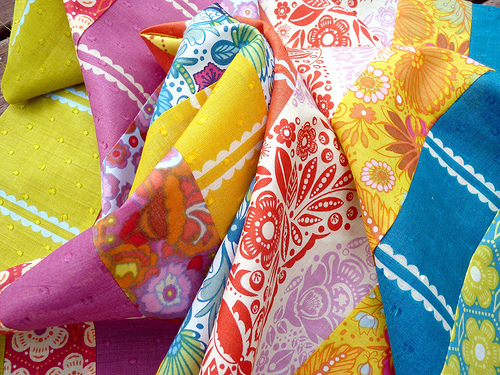 I'm really beginning to love the voile business :P. It looks like another good quilt coming our way. I was happy for you to see that the larger version was bought, it was certainly a beautiful quilt. Thanks for the inspiration. Simply can not wait to see how this turns out, Rita. I have some of the voile...it is divine isn't it? hmmm, looks delicious. this quilt will be stunning. as usual. Looking forward to seeing this one Finish...will be Stunning. I hope you share a lot of pic's of the finished project. 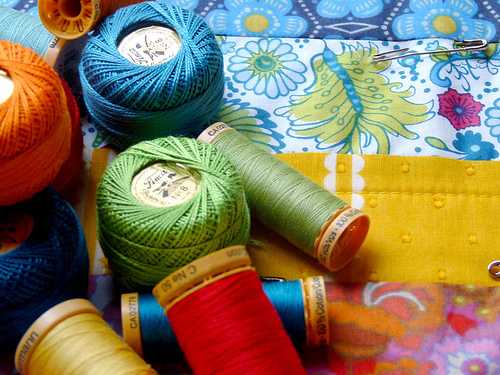 Your use of both hand and machine quilting sounds intriguing and I would love to see what you come up with. Wow! 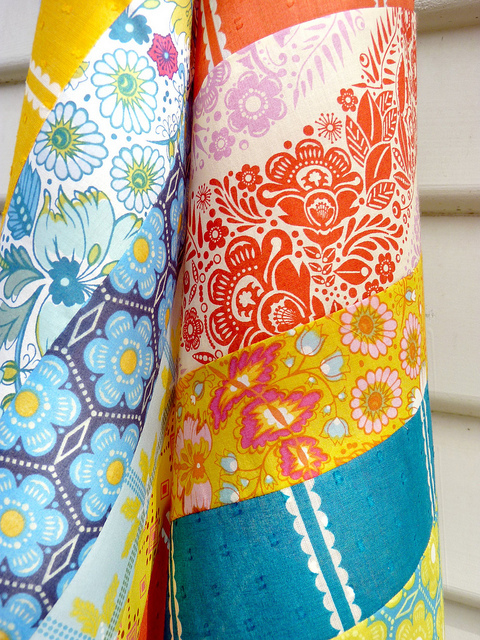 Found your blog through Quiltstory...and so glad I did! You've got some great quilts, I can't wait to look through it all. I'm off to your Etsy shop! Oh, it looks fantastic! You never cease to amze me with your color choices!!! Those fabrics go together so well. It looks so bright and happy and will be stunning with all those coloured threads on it. That quilt is amazing!! I adore it!! !